ABC/Lou RoccoMacklemore & Ryan Lewis are pitted against Kendrick Lamar in five Grammy categories including Best Rap Album, but if it was up to Macklemore Lamar’s CD Good Kid, M.A.A.D City would win the rap award. The Seattle rapper was chosen as The Source magazine “Man of the Year,” and in the January cover story, he says he knows his win in that category will stir controversy. 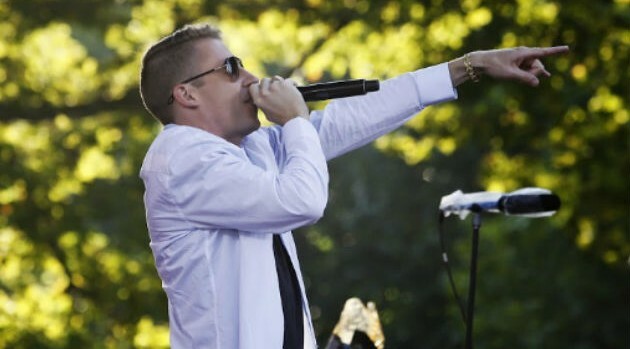 Macklemore also defends himself against the criticism that he does belong in the rap categories. Macklemore & Lewis are also competing against Kanye West in two Grammy categories, Best Rap Album and Best Rap Song, and he says he wants to sign with West’s label and work with him.